This blog will take you through the steps to create a ASP.NET Repeater and show the details of a particular row on jQuery Dialog popup. I was quite a bit into the Repeater control, when I wrote ASP.NET Repeater with jQuery Slider. It is a very useful control to repeat items with well formatted HTML designs. While going through forums, I found members asking questions on opening a popup from the Repeater Row and show details inside that. So, I thought of implementing this with jQuery UI Dialog. Later I will come up with other techniques to do this task. We will show the following details for some demo Employees on Repeater. Let’s see how the design will look like. I will explain different parts of the ASP.NET Repeater. So, inside the HeaderTemplate, I have defined the table and the header rows with Column Names. Then in ItemTemplate, the data rows are defined with proper Label Tags to hold the column values inside table data (td). The labels are getting values by Eval expressions. For instance - Text='<%# Eval("EmployeeId") %>' binds the EmployeeId to the Label's Text..
AlternatingItemTemplate is used so that alternate rows can be displayed differently. The same columns are copied but doesn’t have bgcolor added to them. Last, but not the least, inside FooterTemplate we will close the table. For the whole code, download the project from the link given at the top of this blog post. Pretty simple. Inside BindEmployees(), we are just creating a DataTable with required columns and adding some demo records. // Create DataTable and add Columns. 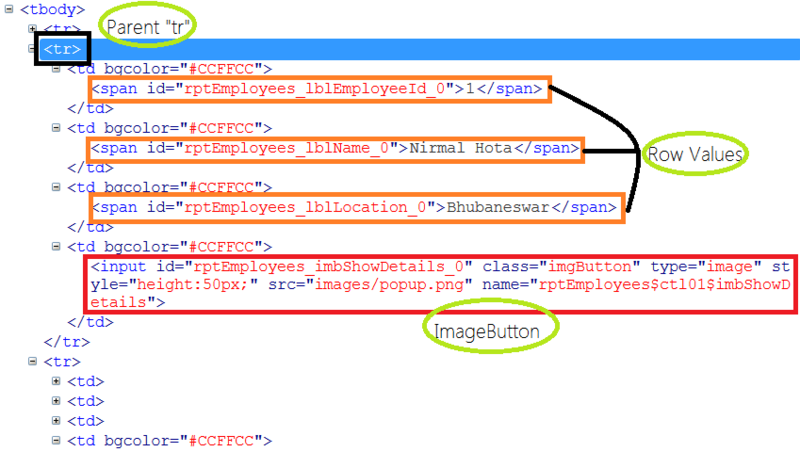 We will design a very simple table to show the details of a particular row on ImageButton Click Event. Below is the HTML of the popup div. NOTE : The highlighted labels will be populated with the row values when you click the popup image. We will explore more on this in the next step. Going further, we will be adding jQuery codes. So, we need jQuery reference. As we will deal with jQuery Dialog, we also need jQueryUI reference. Below is the references we need to add to our page. Now we are ready for the click event of ImageButton. Let’s start writing. This will select all the ImageButtons inside the Employees table. Now, attach click event to it as given below. // We will write all logic here. See the picture below which shows the rendered HTML for the Repeater. So, let’s get the parent “tr” of the ImageButton first so that later we can access all the values inside it as shown above. To get the parent tr, we will use .parents with selector “tr”. See code below. // Get the Current Row and its values. Just need to call jQuery dialog Event for the div popupdiv. // Populate labels inside the dailog. Line 16: Here to make the empName italics I have assigned em tags. But HTML tags are not supported in dialog title. To support that, I have added one prototype as given below, which will just assign the title text to the title html. // Prototype to assign HTML to the dialog title bar. Uff !!! So much code. Let me know, if you liked the blog or not. Should you have any questions or need any help, please feel free to add a comment below or contact me. I will reply and together we will resolve issues. Don’t forget to share this post with your friends and colleagues. You just need to click share buttons displayed below. Pingback: ASP.NET Repeater with jQuery Dialog Popup | Dinesh Ram Kali. What you have tried and where is the issue?